Charming, rustic lakefront cottage on 500+ acre Big Island Pond in Hampstead, NH. Just 45 miles from Boston, avoid the traffic without sacrificing the feeling of getting away from it all. Situated at the end of a half mile private road, Longview Point Cottages provide a unique, peaceful experience for relaxing, swimming, fishing. As the only cottages at the end of Longview Peninsula, you can enjoy the privacy of our waterfront cottage and private beach, we actually have no neighbors! The closest store is within a mile, with a commercial grocery within a 5 minute drive. Conveniently sleeps up to 9 (pull out sleeper sofa included). See Listing Details for additional information. Owner cottage also on site, but not primary residence. Owner purchased cottages in 2016 and lives just 2 miles away and is available to assist with short notice for any questions you may have during your stay. There are not many left like this! We own and operate one of the few properties available for rent on Big Island Pond. We purchased these cottages with the intent of keeping many of the charming qualities of a traditional NH lakefront cottage in tact & we believe we have done just that. Bring your family and friends, we promise you our unique location and the stunning sunsets will not disappoint. Private, no neighbors, close to major highways, grocery, restaurants, golf, Canobie Lake Park, ice cream, etc. Fully equipped kitchen, grill, bed linens, full sized appliances, etc. See listing details for additional information. Bath towels provided, Beach towels are not, please bring your own. Canoe on site, kayaks and stand up paddleboards available for rent for an additional minimal fee. The most amazing vacation We have ever had!!! We arrived at approximately 8:00 pm, it was dark, so we really didn't see anything the first evening. We were grateful that Lisa had everything ready for us when we walked in the door and it was so much more than we expected!! The following day, after waking up, I walked around outside and got familiar with the area. It was so beautiful and peaceful. Lisa made our two week stay so fantastic. We had no problems whatsoever and enjoyed every minute at her home. We are already looking forward to coming back to spend more time by the lake. Lisa was very helpful with information about the area and made our stay more enjoyable. I can't say enough about this place. I rented this beautiful cottage in July '17 for a week. The property inside and out, was clean upon arrival and had everything we needed essentially other than food. The house comfortable slept 9 and easily had room to accommodate the visitors we had throughout the week. The two living rooms were equally cozy. Having cable in both was such a blessing on those rainy days with kids in the house. 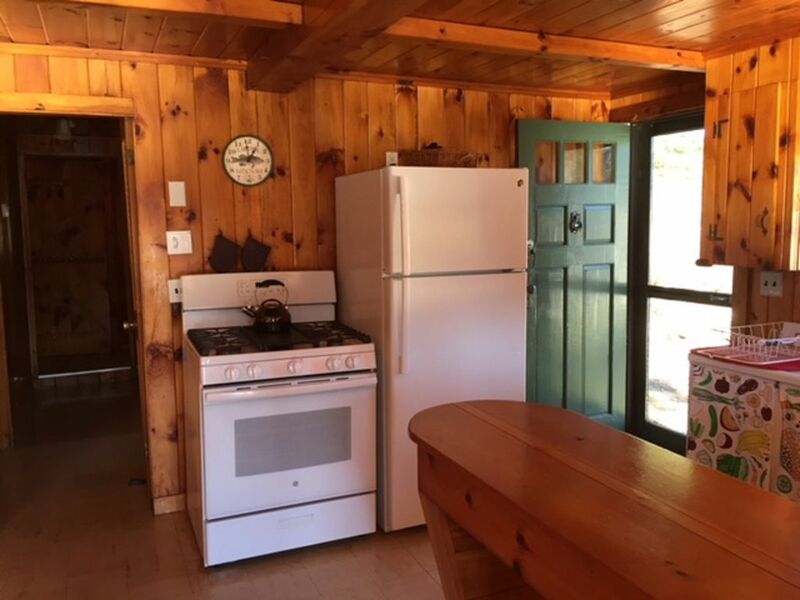 A fully functional kitchen, grill, and close by farm stands/stores made cooking a breeze. I wouldn't even bother shopping/packing at home next time as they were so conveniently located. The lake made an incredible backdrop to all of our pictures (I actually can't wait to see this again in the Fall). The kids (ages 3-12) kayaked, swam, and even fished. We went to Canobie Lake Park one day, and to Chunky's Cinema another, both were 25 minutes or less from the cottage. There was also plenty of room on the property for them to play catch, corn hole, and toss a football around. The owner was so incredibly nice and accommodating with us changing arrival times, providing us directions or suggestions to local restaurants and attractions, removing our trash mid-week, and ensuring we had what we needed to enjoy our stay. We can’t wait to come back! This is certainly my new happy place. We rented this cottage for the week and cannot say enough about the location and how adorable this cottage was. Comfortable slept my husband and I, our 3 kids and had additional sleeper sofa and twin bed for our friends and their son visiting from out of town. Hannaford, liquor store, ice cream stands and Canobie Lake Park are all close by. My husband and I even had a night out at Atkinson Country Club for dinner and it was only about 15 minutes away. The private beach and road to the property was perfect for our kids, we didn't have to worry about neighbors, traffic or safety because we were a half a mile into a secluded wooded lot. The sunsets are gorgeous and we kayaked and fished the whole week. Will definitely be coming back next Summer!